On this tour around Eating Germany, let’s start with the basics. In Germany this inevitably means bready substances, Brot und Brötchen, bread and rolls. I do apologize for the totally exaggerated length of this entry, but that comes with the subject I’m afraid – the multitudinous variety of bread and rolls in Germany is legendary. It is based on different grains (wheat or rye, pure or in all possible mixtures with oat, spelt, buckwheat, linseed as well as millet), coarse or finely ground flours, varying fermenting (sourdough/yeast) and baking methods, as well as shapes and seasonings in the form of nuts, seeds or spices – all developed through specific regional conditions. Bakery shelves all over Germany still offer enormous variety, but a great deal has been reduced to visual attraction, as most of it is produced in factories, usually baked beforehand and finished in Backshops, franchised bread shops. In the 1970s it was easy to find real bakers who kneaded and shaped and baked their wares right behind the shop… Some of them are still around: Hutzelmann in Berlin and Fidelisbäck in Wangen/Allgäu, to name only two, have been making good bread for centuries. 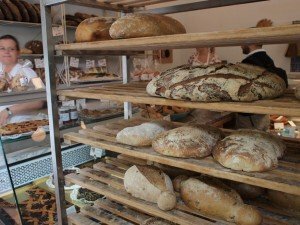 They have been joined by newcomers, such as Soluna in the center of Berlin, a startup with a wood-fired oven right in the shop (and whose delicious breads are shown above). Bread has always played an important role in the folklore and superstitions of old and is still central in the German diet. The traditional cold evening meal in the north and center is bread spread with butter, cheese, cold cuts, called Abendbrot, or evening bread. Brotzeit, literally bread time, is a midmorning or afternoon snack all over southern Germany, and has since long been a valid excuse for the first beer of the day (around 11am), perhaps to wash down a pair of Weißwurst, Bavarian white sausage, with a Laugenbrezel, pretzel. Fidelisbäck uses its ovens to bake Leberkäse, a kind of meatloaf, which I like to enjoy in the rustic restaurant – with local beer, of course. Most southern German butcher shops offer Leberkässemmeln, a slice of freshly baked meatloaf sandwiched in a roll. Historically, dark and white bread marked social differences, but were also based on geographical conditions. Rye is content with lesser soils than wheat. It contains less gluten than wheat, and therefore requires a long sourdough fermentation to rise. This results in a decidedly sour taste in the finished bread, as well as a heavier, more compact texture, traditionally deemed as less luxurious. The darkest and most extreme of those northern breads is Westphalian Pumpernickel. Originally it was called Swattbraut (black bread) and in spite of many stories, historians are divided as to the roots of its 17th century name. It is still made from coarsely ground wholegrain rye with water and salt in large, long, rectangular loaves which steam rather than bake for 24 hours in a sealed oven to produce a sweetish, syrup-like taste. Traditionally it was also fed to poultry and horses. In its most elegant form it is eaten like cake alongside coffee, in a kind of black and white sandwich with Stuten (challah-like white yeast bread), thickly spread with butter. The custom of seasoning bread dates back to the Middle Ages and marks another difference between north and south. In the north, from the 15th century on, bread was eaten with (often salted) butter and other savory and sweet accompaniments, later alongside tea or coffee. Today, only white yeast bread is seasoned for special occasions with sugar, raisins, cinnamon and sometimes cardamom and then is treated almost as cake. In the south however, bread is seen as a separate food item, and often has the same status as potatoes in the north. Caraway, fennel, coriander, and aniseeds in the south are commonly used to season large loaves made from a finely ground mix of rye and wheat, using yeast or a mild sourdough. The sweet bread version in the south is called Hutzel-, Kletzen- or Früchtebrot (fruit bread) which is made in late autumn with dried pears as well as other dried fruit. Today, the organic and health movements have triggered a renaissance of darker, wholemeal breads all over Germany. A similar trend became apparent roughly a century ago. Back then it was triggered by the findings in nutritional chemistry of Justus von Liebig and the subsequent industrialization of food production. Healthier wholemeal breads were propagated by the Lebensreform, a back-to-the-land movement that was a counterreaction against the rapid industrialization. Well meaning reformers were worried by the growing consumption of white bread by workers, mostly in the form of Brötchen, or rolls. However, those well meant, often highly philosophical ideas reached very few amongst the lower classes, and rolls still come in all versions, dark or white. Like many Lebensreform trends though, the coarse, dark Vollkornbrot became official policy in Hitler Germany, as it not only kept longer than white bread, but was also seen as healthier and could include more rye and other less demanding, homegrown grain varieties. Back then the German economy was built up with the goal of self-sufficiency. In our family, rolls as opposed to bread used to be a luxury reserved for the weekend and special occasions like a birthday, and the absolute treat for me were Mohnhörnchen, a kind of soft white croissant sprinkled with poppyseed. Nowadays I find most of what is sold under this name very bland, somehow empty in taste; but new kids on the block use organic wholemeal ingredients without turning out overly heavy, pretentiously „healthy“ results. My favored Mohnhörnchen are now made from organic wholemeal wheat which is stone-ground on the premises of the Weichardt family’s bakery in Berlin (this is Heinz Weichardt above – courtesy of photographer Stefan Abtmeyer). I don’t necessarily subscribe to the latters’ anthroposophic principles, but their Mohnhörnchen provide the best start of the day, tasting just as comforting, inspiring and truly nourishing as the ones of my childhood. I know, you’d all love me to give you the recipe, but I’m afraid that’s a Weichardt secret. Here, however is my favorite Hutzelbrot, a sweet winter bread treat with loads of dried fruit which keeps very well and tastes delicious on its own or with fresh butter at tea time. You’ll find the unusual flours in healthfood stores. Cut the dried fruit in pieces of about half an inch. In a bowl cover them with water (approximately 1 liter) and leave to soak for 5 hrs or overnight. Drain, reserving the liquid, and roughly chop the fruit. Using the dough hook of your stand mixer (you could do all the following with your hands, it just takes more muscle), mix first the two types of flour with the salt and the spices, then add the fruit and nuts. In a separate small bowl combine the yeast with 250ml of the fruit soaking liquid and the honey. At slow speed, add this mixture to the flour. You will certainly need to add more of the soaking liquid to form a slightly sticky dough but the exact quantity depends on the flour. Scrape the sides of the bowl clean to form the dough into a ball. Sprinkle with 2 tbs rye flour, cover the bowl with a clean towel and leave to rise for 5 hrs in a place that is rather on the cool side. At the end of this, preheat the oven to 170°C. Take the dough out of the bowl, knead lightly to form two oval loaves which you place on a lightly greased baking tray and bake for one hour. Immediately after baking, combine 125ml of the soaking liquid with the sugar and starch and brush over the hot loaves. When cool, wrap in waxed paper and store in dry, cool place – it will taste better if given at least a week . Special thanks are due to Marguerite Kenner for punching this into stylistic shape. Weiter → Nächster Beitrag: Eating Germany II: Bergkäse – mountain cheese calling! I plan to make the Hutzelbrot. But“, I think they forgot to tell what to do with the fruit after, soaked and, the nuts. When do I add it to the dough? Hi – thanks for making me aware of that glib, and apologies. Corrected by now – happy baking! Thank you for the wonderful, informative post. Most resources are in German and I can barely navigate a Markt, so this was a great find. 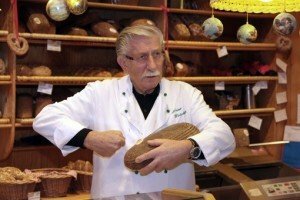 Hallo – selbstverständlich gibt es viele Brotbackbücher, zum Beispiel Gut Brot von Günther Weber, http://www.amazon.de/Gut-Brot-will-Weile-haben/dp/3775006532, oder auf englisch, Malin Elmlids Bread Exchange http://www.amazon.de/Bread-Exchange-Recipes-Journey-Bartering/dp/1452119627/ref=asap_bc?ie=UTF8. Viel Spaß beim Backen!